Focus Xi is the ideal entry-level peptide instrument where small numbers of peptides are required. It features one glass reactor with nitrogen bubbling mixing, 16 amino acid/reagent vessels and 5 larger solvent/reagent bottles. Focus XC peptide synthesizers with 2, 4, or 6 reactors are ideal where a large number of high quality peptides are required in research quantities. 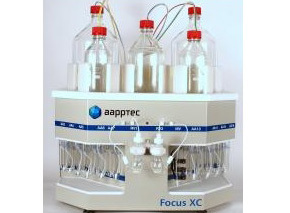 Focus XC peptide synthesizers in the standard configuration have 24 amino acid containers. Optional configuration has 36 amino acid vessels.